All life is a honeymoon, right? No? Crap. Well, there is good news. We have cocktails to help bring us up to that honeymoon level any time we like. Now, you’re never going to guess this after that cheesy intro, this week’s cocktail is none other than the Honeymoon Cocktail. After mixing up the Calvados Cocktail a couple weeks back I have a re-found love of the fresh apple flavor that Calvados brings. And, to make things even more exciting, this drink adds in some Benedictine. Suffice it to say I’m looking forward to mixing this one up. So, let’s do just that. The Derby – A Cocktail Mashup? Are you familiar with the idea of a mashup in music terms? It’s when you combine elements of one song with elements of another and the result is a new, hybrid song. There are tons of examples, but here’s one of my favorites to get you started, “Galvanize the Empire” by Party Ben. With me now? The Derby is what I would imagine the cocktail equivalent of a mashup would be. Bourbon and sweet vermouth from a Manhattan. Sourness and sweet from a Whiskey Sour. Combine all these elements and you have the Derby. And, like all good mashups, this one is harmonious and stands on its own. Before I discuss the taste at length, let’s briefly talk about the changes I felt were necessary. First, this drink as printed in Vintage Spirits and Forgotten Cocktails is tiny. I get that old school drinks were typically smaller than what you’ll find these days, but this one is tiny even by those standards. So, I bumped everything up by half and I’m much happier. Next the lime in the recipe overpowered the other ingredients a little. So, when I did my quantity increasing I didn’t increase that one as much, though it’s a pretty minor decrease. Ok, now let’s talk tastiness. Although I stick by my claim of a mashup, the flavor of this drink is definitely more in line with a Whiskey Sour. Though, instead of bitters to add complexity here you have vermouth. Certainly they add complexity and spice, but it isn’t as forward and bold as bitters can be. Instead the sweet vermouth adds an undercurrent of flavor complexity. I’d challenge you to tell me it was there without knowing, but the drink would be much flatter without it. The lime juice as well changes up the flavor dynamic. Ever made a Daiquiri with lemon instead of lime juice? It’s a lot like that. Finally, with my small tweak to the sourness level I find this drink to be really well balanced. Overall this is definitely a super tasty cocktail. You absolutely shouldn’t wait for the Derby to give it a try. Comments Off on The Derby – A Cocktail Mashup? 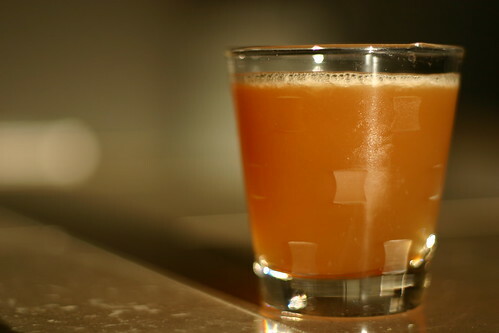 When I think of The Derby, the first thing that pops in to my head is awesome bourbon cocktails. I’m not much of a horse racing guy, what can I say. Though, when said bourbon cocktail pops in to my head it’s usually a Mint Julep in a frosty silver cup. So, I have to say, when I saw the recipe for The Derby in Vintage Spirits and Forgotten Spirits I was intrigued. It’s a bourbon cocktail with sweet vermouth and lime juice. See, interesting stuff going on here. Looking forward to the flavor interplay to come. If you follow this blog you certainly know I’m a big fan of analogies and thought experiments. I’d like you to engage in another one with me now. Think back on a truly uninteresting cocktail you’ve had in your life (or meal if you prefer). Do you have a clear memory of it? I don’t. In fact, it’s truly hard for me to remember uninteresting moments in my life. Which actually makes perfect sense. Interesting points are ones that we recall regularly and, quite likely, tell others. Both of these actions cause that memory to get further ingrained in your brain. The boring stuff just slips away. The Harvey Wallbanger is one of those uninteresting memories that I’ll probably quickly lose to the sands of time. Sure, it’s not a bad cocktail at all. In fact it’s quite tasty. But, is it great? No. Let’s face the facts, this cocktail is a Screwdriver with a twist (pun fully intended). That twist, the Galliano, really isn’t that much, either. Galliano, if you’re unfamiliar, has a light vanilla and anise flavor; emphasis on the light. It’s very nicely balanced, but doesn’t pack a huge punch. Now, it’s interesting. As I mentioned in the intro, my bottle of Galliano is, or should I say was, old. At least 8 years to be exact. Generally not a huge problem…might have lost a bit of punch..maybe not getting the real cocktail experience…crap, new bottle time. My old bottle was of a 60 proof (30% ABV) variety that is now being phased out for the original, an 84 proof (42.3% ABV) version. Is there a difference, yes, definitely. The classic version (84 proof) packs more punch and has a stronger flavor. Does it elevate this cocktail to greatness? Well, no, not so much. Still good though! So, what’s the take away? If you have a seriously old bottle of Galliano on your shelf consider getting rid of it. Drinking, dumping, or tossing out the window is totally up to you. Last note before I truly do move on. The orange juice I used for this cocktail (Odwalla if you’re interested) was a little under-sour for my taste, at least for cocktail use. So, I added a half ounce of lemon juice to the mix and found it much better. So, there you have it. The Harvey Wallbanger. Good, sure, but not amazing. If you’re planning to mix up some Screwdrivers in the future it’s worth trying this twist, but don’t go too far out of your way. In looking through my fridge for inspiration I found orange juice. Hmmm… Then I remembered the bottle of Galliano that’s been sitting on my shelf for a sizable number of years. The fog cleared at that point and what was left was a vision of a classic that seems straight from the 80’s at first glance. 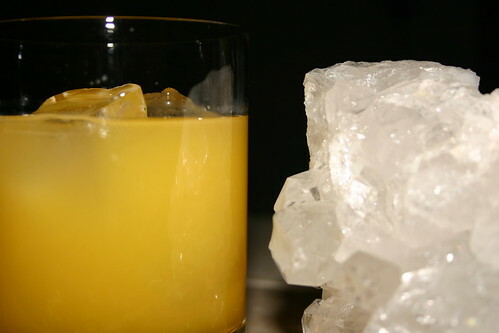 The Harvey Wallbanger combines orange juice, vodka and a touch of Galliano. Sounds like one of those brightly colored 80’s drinks with little character, no? Guess I’m (we’re) going to find out! I purposefully didn’t include any history on this drink. Why, you might wonder. Well, Regan has an interesting story about a man named Harvey banging his head against a wall after a party. Wikipedia has a completely different story. The truth? Not really sure and don’t much care. Let’s get to the sampling.